We are all interested in the bottom line, but medical professionals know that cost is not the only important factor in managing patient care. 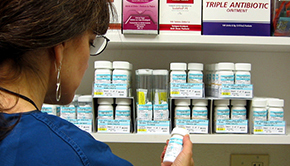 In-office prescription dispensing cuts expenses for patients and can increase your own revenue. 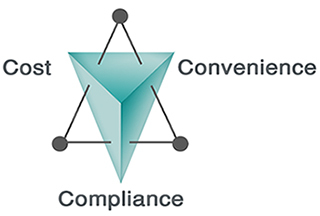 Together with convenience and compliance, it is more than good sense. It is good medicine. 1. Packing yourself? Pre-packaged prescriptions save your clinic staff valuable time and reduce your liability. A Pharmedix® prescription can be dispensed in less than one minute, less time than to write a prescription. You never need to order vials, count pills, print labels or stuff cotton balls. Record keeping and ordering is quick and easy. 2. Pharmedix® also works with you to develop a therapeutically appropriate formulary for your population. For example, a college student health center or urgent care center can often treat 80-85% of their cases with just 20-30 medications (mostly generic) at an average cost of under $5.00. In addition, Pharmedix® always alerts our clients when a less expensive generic formulation of a brand drug becomes available. Prescription medications are an integral part of providing accessible and affordable health care for a number of different types of patient populations. It is important to make access convenient for busy college students or for workers with an industrial injury or for indigent patients with limited access to transportation. Providers recognize that having medications available at health and wellness centers greatly reduces the risk of non-treatment, self-medicating and sharing of drug therapies among patients. Courses of therapy can be started right away under provider supervision. Low Cost and Convenient access improves patient Compliance and therefore increases the likelihood of a positive treatment outcome. Providers know that there is a diagnostic value to patient compliance. If a patient returns with similar complaints, a provider is better able to assess treatment failure if they can be sure the prescription was actually dispensed at the previous visit. It currently estimated that over 30% of prescriptions are NOT filled by patients for a variety of reasons including cost and convenient access to a pharmacy.